Prateek Explosionproof has achieved remarkable strides in the field of explosion-protected equipments over a period of last 9 Years. Having started its operation at Thane. 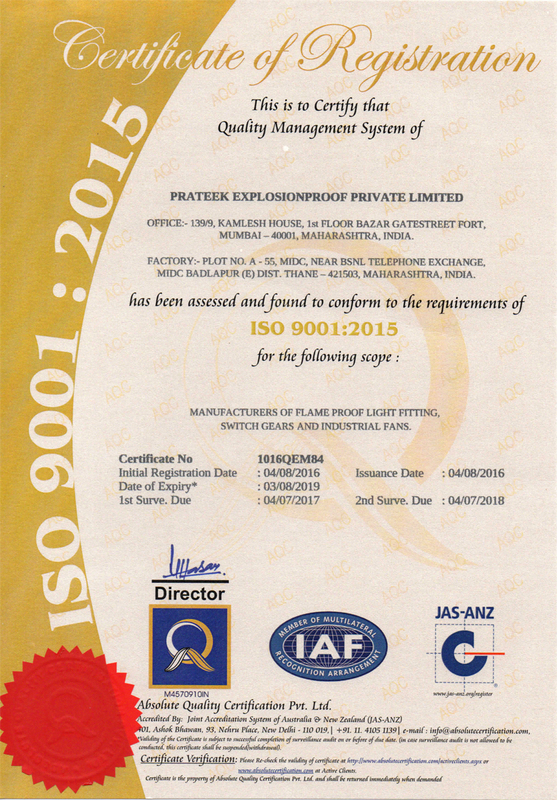 Mumbai in 2003, Prateek Explosionproof has come a long way up and established itself as a leader in this market segment. Operating from its Regd Office at Mumbai. Prateek Explosionproof has been able to be at the close proximity with the customers. Prateek Explosionproof offers products confirming to the Indian standards covering Flameproof Light fittings, Flameproof Control Gears, Flameproof Junction Boxes, Flameproof Industrial Fans, Flameproof Instrument Boxes and Weatherproof Instruments. All our products are approved and certified by CIMFR Dhanbad for gas group I,IIA, IIB & IIC, Zone 1 & 2 as per IS/IEC:60079-1/2007.,DGFASLI Mumbai, BIS and CCOE Nagpur. Prateek Explosionproof believes in constant up gradation of the products to meet more stringent benchmarks for Safety, Reliability & Performance. Explosion protected equipments are meant for installation and use in these hazardous locations to ensure safety of plant, equipment and personnel and to ensure safety and reliability of operation. Our new products respond not only to the changing demands of our customers, but also to the global shift towards automation and constant need for up gradation. Our products are already used in various industries such as Petrochemical, Refinery, Oil and Gas, Oil Mines, Pesticides, Chemicals, Fertilizers, Bulk Drugs, Pharmaceuticals and Ordnance Factories. Technical operational safety is guaranteed by Prateek Explosionproof using superior quality material, in-house product development, meticulous testing and inspection at various stages of production.